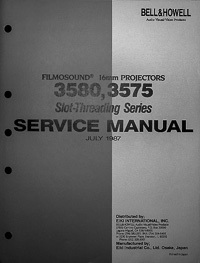 Bell & Howell / Eiki 3585, 3592, 3592AX Service and Parts Manual Discounts Apply ! 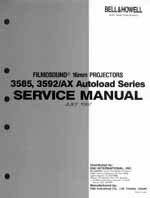 Excellent quality photocopy of the original 1987 Service and Parts manual for the 16mm Bell & Howell Autoload movie projector models 3585 and 3592/AX (can also be used for the identical Eiki SNT/ENT models of self-threading projectors). 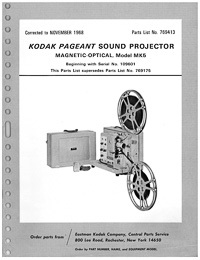 This 135 page manual is printed on double sided 8-1/2" x 11" heavy weight paper and it contains 8 double sided 11" x 17" fold-outs just like the original. This manual has a card stock cover and is plastic comb bound so it will lay flat on the workbench. 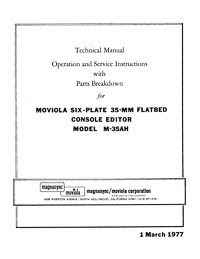 The heavily illustrated service manual contains sections on technical specification, principles of operations, service procedures, module removal and installation, module repair and adjustment, sound system, general service and adjustments, troubleshooting and complete electrical circuit diagrams.